The second parameter is the script to execute. 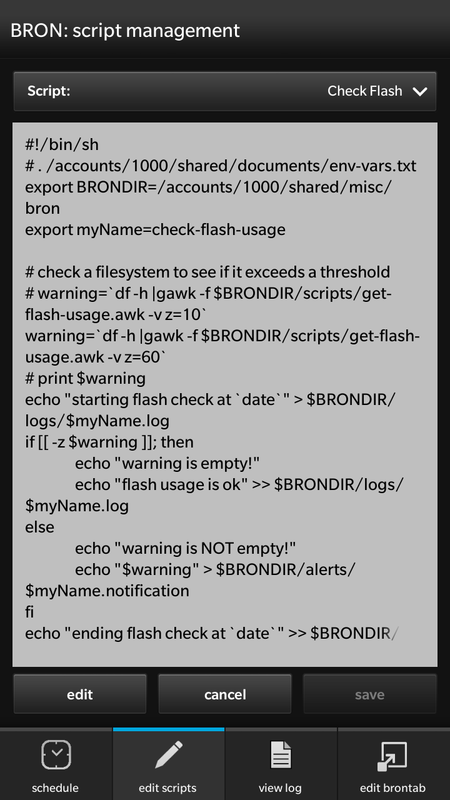 Scripts should be stored in /accounts/1000/shared/misc/bron/scripts/ on the flash of your device. A script is just that; a shell script written in ksh and designed to do something of value on your BlackBerry 10 device. The best way to prepare scripts is to download the BlackBerry 10 NDK which includes the Momentics IDE. The IDE makes it easy to ssh to your device and get a shell. From there, you can create your scripts and when you’re satisfied, you can copy your scripts to the noted directory. Of course, you can copy scripts to your device over the file share (if file sharing is enabled) as well. Once the scripts are on your device, in the right directory, you can edit them within the app too. This makes it easy to tweak things, or adjust parameters or variables without leaving the app. BlackBerry has some good documentation on the shell too! There are lots of commands available in the BlackBerry 10 shell. I encourage you to experiment, poke around, see what you can find out. The cp command is also worth looking at, notably the -n option. go explore!